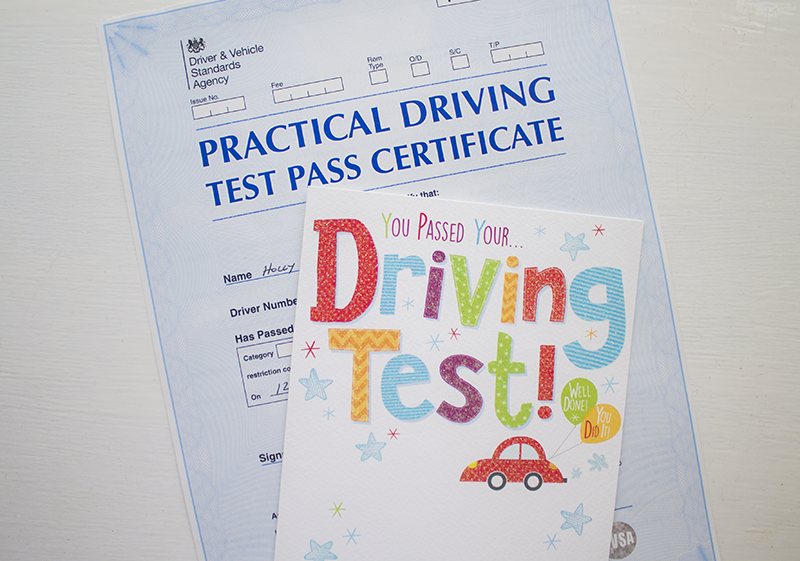 As I’ve already mentioned, last Monday I passed my driving test! So I thought I would reminisce a little about my journey to driving, as it were, because let’s be honest, it wasn’t exactly straight forward. Before I turned 17 I was super excited about learning to drive. I got my provisional license as soon as possible and counted down the months until I was old enough to start learning. I lived in rural Shropshire were public transport is almost non-existent. I wanted to be able to go shopping without having to sit on a bus for an hour, only to end up in a town with mediocre shops. But then for some reason, and I’m not totally sure why, my enthusiasm started to fade. I turned 17 and didn’t book any lessons. I kept saying how I would eventually book some lessons, but I just kept putting it off. I guess it didn’t help that I had zero income to be able to pay for lessons myself, and I wasn’t that desperate to get a job. It was almost a year after I turned 17 that I started driving, but I started off in a rather unconventional way. My good friend Becky owns a ex-instructor car which has the option of using dual control pedals, and so her dad kindly offered to give me a few lessons on an airfield to let me get to grips with driving before I started my lessons. I was really grateful for this as it made it easier and less scary when I did eventually book some driving lessons the following summer. My mum booked me some lessons in a manual car (because that’s the most common option in the UK) and off I went. If I’m being completely honest with you, I didn’t enjoy driving. It soon became clear that I was struggling with clutch control and it was becoming very painful for my left hip. Also, when driving long distances when I didn’t need to use the clutch I would lose feeling in my foot. I wasn’t enjoying driving because of the pain, and I really started to worry that it was unsafe. The worst thing is, nobody seemed to believe I was struggling. I appeared to be progressing well with my driving lessons, but what people didn’t realise was I was in agony throughout every lesson, and that was impacting on my confidence. I stopped my lessons because of a number of reasons. 1) Because I had no money. 2) Because I was moving away to university, and I would have even less money. 3) Because I was in too much pain. I got frustrated and actually snapped at a few people for making this suggestion. I still can’t believe people were so quick to dismiss the idea of learning in an automatic. Anyway, I went off to university and for those three years driving was the last thing on my mind. Not only could I not afford, I also lived in a flat where parking cost a fortune and so I had no really incentive to get a car. But then I got a job (and an income) and a house (with a driveway), so suddenly driving became more desirable to me. I finally got the kick up the arse I needed when I found out that the train route I take to work (under the river) would be closed for several months at the beginning of 2017, and so I really needed to get a license and a car or else I would have to start taking the bus to work (*shudders*). Finding an automatic instructor was not an easy task, especially in my area. There were loads serving the Liverpool city centre area but none on the Wirral. I emailed and called so many companies before I got a response. I even considered learning in the city centre and just getting picked up from work. I remember my mum asking if I had picked a reputable one, like I had any choice about who I went with! But thankfully I ended up with a lovely instructor who make my lessons enjoyable, and who taught me all about the area that I had only just moved to. As soon as I started driving in an automatic I knew that I was going to enjoy driving. I didn’t have to worry about being in pain, or losing feeling in my leg anymore. I was feeling so good about it I booked my theory test right after that very first lesson. I passed my theory first time. Even though I had revised every single day I only just passed the theory section of the test, but I nailed the hazard perception part. Spoiler: hazard perception is much easier than you think it’s going to be. Soon after I took my theory I booked my practical test. Overall it took me 5 months from starting my lessons in an automatic to taking my practical test. Honestly, I didn’t feel ready, but my instructor was convinced that I was. Even on the day of the test I was certain I was going to fail, and I was ready to accept failure. I saved a few days of annual leave just in case I needed to take the test again, and I started working out how many more tests I could fit in before Christmas. I just got in the car with the examiner, set off and tried my best. There were many moments throughout that 30 minutes that I was sure I had failed my test. I remember forgetting to indicate at a junction, not realising a certain area was a 20 mph zone and not doing enough observations when doing a turn in the road. So you can imagine my shock when the examiner told me I’d passed. And, how good I felt when my instructor told me on the way home that the examiner I ended up with was renowned for being harsh and failing people. I think I just got lucky, but at least I’ve got a licence now! Next step will to buy a car and to get familiar with driving on my own. I’m so excited for this new found freedom. I’m looking forward to being able to drive to work, go on adventures beyond the routes of public transport, and best of all, be able drive back to Shropshire. Do you have a license? If not, would you like to learn to drive? ← The Weekend Blog | I passed! I was like you in terms of driving as well. I was never the type to rush to learn, although I wanted to and knew it would be useful. I was partly lazy and a partly scared. I didn’t end up bothering till I got a full time job and the train journey was just too difficult. I think I was also lazy and scared! I have to take two trains to work at the moment so getting a car may cut my commute time in half! Congrats again on passing your driving test! That’s nice that your friend’s dad gave you a few lessons early on. Before I started lessons, my mom taught me a bit in a large empty parking lot. That definitely helped when it came to the actual lessons! Buying a new car is exciting! Good luck! Thank you! I think getting some practice in before lessons is so important. It’s so scary once you hit the roads. Whenever people question me about my choice to drive automatic I always say “Everyone does it in America!”. I think you guys have got it right! If I ever need to hire a car in the US I’m sure I’ll find it easy. Learning how to drive is an interesting and nerve-wracking journey. I feel like us in the US are spoiled by automatic cars when manual is really a normal thing everywhere else. There’s nothing wrong with learning automatic; the cars these days can shift a lot faster than people with the clutch. I’m glad to hear that you’re licensed now after all of the practicing and the likes. Good luck with finding that car you want! I got my license when I was 17 even though I didn’t really want to at the time. I’m thankful for it because it gave me a chance to actually drive to college a year later. Now, I’m stuck in traffic every day for about an hour each way driving to and from work XD. Congrats again on getting a license! My car changes gears so smoothly I don’t even notice. I don’t know why people love manuals so much! I think you did the right thing by taking your test early on. I regret not taking mine sooner. I’m glad you had a nice instructor as well. Nothing worse than having a really mean one. I was very scared that when I chose to have some driving lessons, I would be stuck with someone who would be mean and scary. But I got a referral from Nick, and I got an instructor who was lovely and very funny, she made me feel very comfortable driving and gave me tips on how to pass the test. It’s so hard when people don’t understand, but I’m so glad I didn’t let other people’s opinions change my decision. I honestly think I’d still be learning now if I’d chosen a manual and I just know I would have hated it. My brother has drove automatic hire cars before but normally drives an manual, and when he was sitting in with me when I was driving back to Liverpool he said he’d forgot how much easier and more relaxed it is driving an auto. I think I might be converting people! Having a good instructor really makes all the difference. I enjoyed my lessons because we always had a good chat, and he told me he’d really miss my lesson when I passed.